These Very Rare Limited Edition, Out of Print 24k Gold Audiophile CDs ensure the most accurate reproduction of the music with all analog to 20-bit digital conversion from the original master tapes. 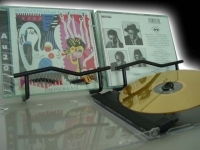 These 24k Gold CDs sell for as much as $150+ each in the collectorís market, so donít miss out before they skyrocket in value or will never be seen again! Ryko 24K Gold CD. A landmark recording of taste and style, "Imperial Bedroom" is often cited as reminiscent of The Beatles, an influence no doubt inspired by the presence of co-producer Geoff Emerick, who engineered The Fab Four's most ambitious records. Brilliant gems such as - "Shabby Doll" - "Man Out Of Time" and "You Little Fool" - sparkle on this classic album. Includes special feature of 10 extended play tracks! 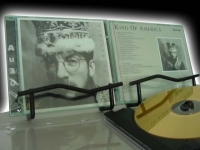 "Elvis Costello, King Of America"
Ryko 24K Gold CD. The Costello Show delivers a 15 song triumph, spanning a range of styles (as usual!) effortlessly. Produced by T-Bone Burnett and featuring Ray Brown, James Burton ((Elvis and Rick Nelson's lead guitar player), Mitchell Froom, David Hidalgo, Jim Keltner, and Earl Palmer, this 20 bit re-mastered album stands among Costello's best. Includes an additional 5 extended play tracks.